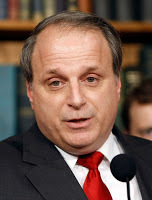 Rep. Eric Massa: The Democrats Sank Me Because I Opposed Health Care Reform - Joe.My.God. Rep. Eric Massa (D-NY) says that the male sexual harassment investigation that forced his resignation announcement was a revenge plot by fellow Democrats for his opposition to health care reform. “Mine is now the deciding vote on the health care bill,” Massa, who on Friday announced his intention to resign, said during a long monologue on radio station WKPQ. “And this administration and this House leadership have said, quote-unquote, they will stop at nothing to pass this health care bill. And now they’ve gotten rid of me and it will pass. You connect the dots.” Massa insisted that he did not know the basis of a House ethics committee investigation into his conduct until after he announced his retirement last Wednesday, and he took House Majority Leader Steny Hoyer (D-Md.) to task for going public with information related to the probe before it is complete. According to Massa, the sexual harassment charge comes from wedding party he attended on New Year’s Eve.